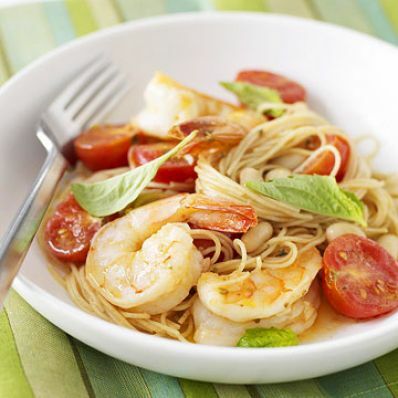 A tomato and white bean ragout sauce peps up shrimp and angel hair pasta in this main-dish recipe that can be ready in less than 30 minutes. 1 of 4 Cook pasta following package directions. Drain and toss with 1 tablespoon of the olive oil. Keep warm. 2 of 4 While pasta is cooking, season shrimp with 1/2 teaspoon of the lemon pepper. Heat remaining tablespoon oil in a nonstick skillet over medium-high heat. Add shrimp and garlic; cook 4 minutes or until cooked through, turning once. Remove and keep warm. 3 of 4 Drain and rinse the beans and add to the skillet along with tomatoes, Italian seasoning, red pepper and the remaining 1/4 teaspoon lemon pepper. Cook 5 minutes over medium heat. 4 of 4 Serve the ragu over the pasta and shrimp.